Babydoll for my babydoll, originally uploaded by RonikinsKnits. 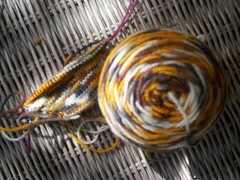 So when uploading projects into Ravelry I got a *little* inspired to take photos of things I knit pre-blog. I say little, because I didn’t hunt down all previous gift-ees and demand photos of the knitted gifts, nor did I pull out My Babydoll’s baby box and gather up the many hats, mitts, socks, booties, or sweaters. It’s a funny thing about being pregnant while learning to knit/crochet, you knit ALOT of baby things! And I did also come across a few items that I took photos of before the blog just for my Momma’s sake. You can check them all out in my Flickr account. But I did feel like talking about one past knit in particular….the babydoll for My Babydoll. This is definitely one of my most favorite knits. I had originally planned to knit up more of these for my nieces, but it turns out I’m not BIG enough for that yet. It’s weird, I feel kind of protective over this doll. I wanna make sure she’s handled and loved right. And I don’t think is exactly appropriate to give a gift with a list of do’s and don’ts to a 3 yo, you know? Honestly I barely let My Babydoll handle this one, and frankly for good reason. Right after I took this photo she ran away with it and dipped it in a puddle (from the sprinklers) and was mopping the cement with it. Luckily it wasn’t badly damaged and recovered. So even though My Babydoll is usually very loving and gentle with here babies, that is her normal behavior (I would label that abusive, no?) with this doll. Do ya think she might suspect (and disapprove) of my emotional attachment to a toy I knit for her? Ah well, maybe we can mature together. It is however unfortunate that the doll still sits around in its undies. One day my love for it will generate a need to clothe it. One day. Oh and a little bit of details…. Mods: I knit everything in the round via Magic loop instead of flat. I used Judy’s Magic cast-on for the head, and possible the body…I don’t really remember. This was also the first time I used that method and liked it soo much that I decided to possibly convert to a toe-upper…and I did! Shadow Shrug beginnings, originally uploaded by RonikinsKnits. This is all that nap time allowed to get accomplished. At least it’s a beginning. The yarn is Caron Shadows, and the pattern is the free one from the yarn wrapper, The Simple Shrug. Shocking, huh. Hopefully you yarn snobs won’t shun me too bad. But really it’s not a bad yarn and I love the colors, and if this one works out hope to do another in the Opal Twist color way (the Dark Moss is pretty too, but three might be too much) So anyway, I bought this yarn early last fall and actually did cast on right away. 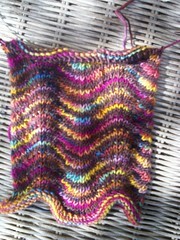 But realized a few inches in that “No I did not want to knit this flat” as the pattern instructed. It’s knit sideways from cuff to cuff, and the sleeves are supposed to be sewn up. After I frogged it, I got distracted with another project and the yarn when back into the stash. I’ve really wanted to re-cast on for awhile and now I have. I’m knitting it in the round and it feels much better. I know it’s kinda of trend of mine to knit things in ways which do not require seams, but this is not to avoid seaming….cause I love me some seaming . It’s to avoid the actual seams, I think it’s one of the benefits of hand-knitting…no seams. That and I prefer knitting to purling. Opal Regenbogen, originally uploaded by RonikinsKnits. 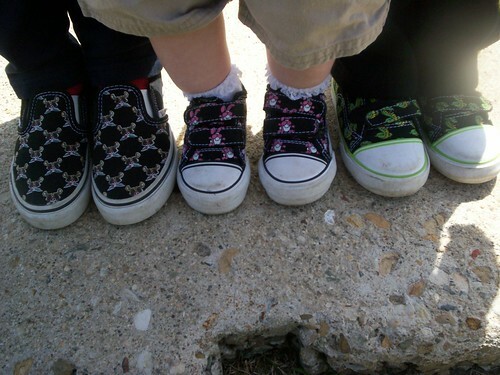 I can’t believe it’s been this long since I last blogged. I even had to look up my password. Well…oh well. I guess I’ve been busy, but the good kind of busy. You know…camping, beach days, park visits, yadda, yadda. Good times. I’ve also been planning a new crafty project. I’m very excited about it and will blog about very soon (just not ready yet), but it involves using the Hubbo’s artistic abilities. Yeah for a team project! But I will give some knitting updates, just for fun you know…. Chevron Scarf. Still going almost done. Rainbow socks. I’m doing 2 at once (on separate needles) and knitting on 0’s at 10 spi (I know, 10 spi! whattha!?!?!) so these are a little slower than my average socks. BUT…almost done. Tiger socks. I’ve tried 0’s, 1’s, 1.5’s, 2’s,3’s…but it’s not working. (Which reminds me, have ya’ll heard that Knitpicks heard us and have made and already selling the elusive 2.25mm & 2.75mm sizes. Yaaa!!) I’m trying to do the impossible of controlling the pool and still have a nice tight sock fabric. Right now I’m sick of it, but when I’m ready to give it a go again, I think I’m gonna do Jaywalker’s. My first, oh my! 1. If you don’t have a Flickr account, get one. 2. Then take glamour shots of all your stash and upload them to said Flickr account. 3. Make a list of all your knit books. 4. Make a list of projects your interested in. 5. Make a list of all your needles and hooks. #4 is related to probably one of the best things about Ravelry there is. When I’m starting or even just thinking of a future knit. First I Google it and try to see what other people have done, what yarn, etc. Sometimes wading through pages & pages of Google results. Sometimes I get lucky and there is a knit-a-long. But then still lots of digging through posts and people’s blogs. On Ravelry it’s just one click to see all the people who have knit or are currently knitting it. Also with some uniformity in details (yarn & needles used). LOVE. Sweeet love! 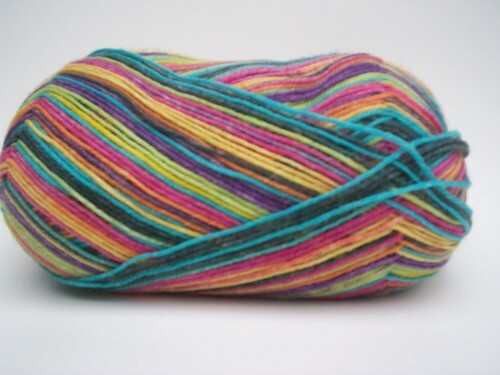 So enough of that, but do feel free to email or comment with any questions re: Ravelry. I also am about to cast on something new (naptime knitting woohoo!) but will save that for next time! ****BTW: Yarn pictured it just one of my glamour shots from the stash for Ravelry. I am still here, and with no other reason for my absence than not having much to say. I haven’t been knitting much, which pretty much makes me feel not like me. And the short version is CPH has robbed me of my knitting mojo. The love of knitting CPH is gone and has been for awhile. But I made this ridiculous pact with myself to not cast on anything new until it was done. But here’s where I do something, that as you get to know me, you will find I do quite often. I draw this self imposed line in the sand, and then I CROSS it. 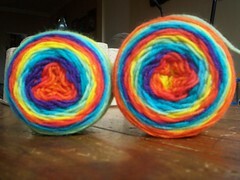 This could be the beginning of a Clapotis or I may end up being a copycat and do this. 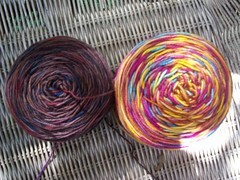 But this is less about the project and more about the yarn. 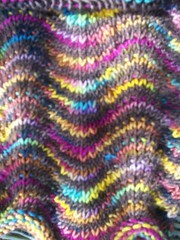 Trekking XXL, colorway 100 (click for photo goodness!) Oh colorway 100 how I love thee! I’ve got quite a love story between me and this yarn. 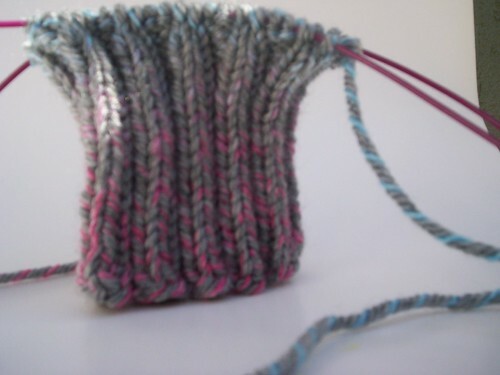 It was the first sock yarn I ever bought. And that purchase did in-fact change the way I viewed this little hobby of mine. I was extremely pregnant and the Christmas was fast approaching. 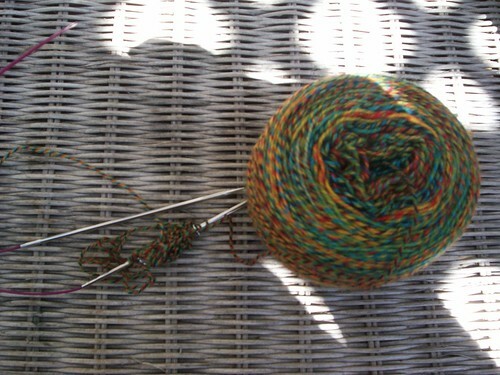 I was a brand spanking new knitter, and I had yet to come to terms with the cost of knitting. It still just blew my mind that the cost to knit a baby sweater could buy you a couple of outfits at Target. 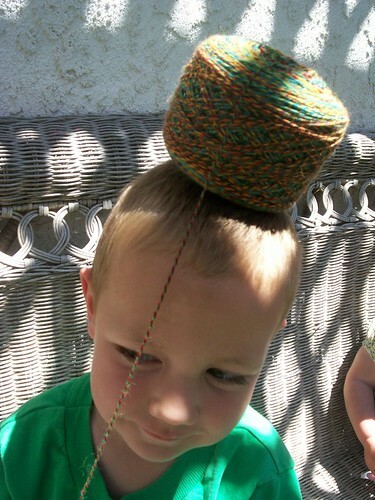 And oh how I laughed at you sock knitters. $20+ to knit a pair of socks!!! You’ve got to be kidding me. And so I do what I do, I drew that line and declared “I will never do that!” Then it happened. 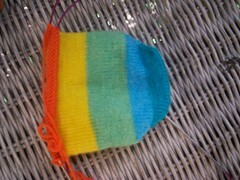 I don’t remember where or how but I came across a finished pair of socks in Trekking colorway 100. The colors made me dizzy with lust. Must. Have. Now. And I did. I Googled and made a purchase before I could blink. Then I thought: (that could be another reoccurring theme of mine – do first, think later.) “What did I just do? I bought sock yarn. I don’t knit socks. I don’t even know how to knit socks.” And then I spent a lot more time in my head explaining and justifying, and also practicing my explanation to the Hubbo. I really thought he’d think I’d gone and completely (cause I have made previous incomplete attempts) flipped my lid by spending $20 to knit ONE pair of socks. But being the kind, thoughtful, loving and caring Hubbo that he is (really HE IS!) he saw it completely different. He saw his wife happy and excited about some something beautiful and thought that was quite worth the $20. It took me awhile but then I saw it his way too. (he may regret opening my eyes to that now when he sees my stash. Opps, hehehe) So I bought Charlene Schurch’s Sensational Knitted Socks and learned me to knit some socks, and I became sock knitter. The Trekking yarn was still to beautiful to just dive right in, but served great purpose being eye candy to me for the last year+. And I always felt that there might be a better project for it than socks. Luckily Sandy (blogless?) at knit nite was a step a head of me and is knitting the Entreleac stole form Scarf Style with my love yarn. It is gorgeous! (the link above is another local knitter who is knitting it too) But I’ve also been looking around from some Clapotis yarn. So it’s still in swatchin’ stages here, and I’m undecided as to what scarf it will be…but I’m feeling like me again already. Knitting with passion. Last night, at knit night, I was the reciepent of a wonderful gift. 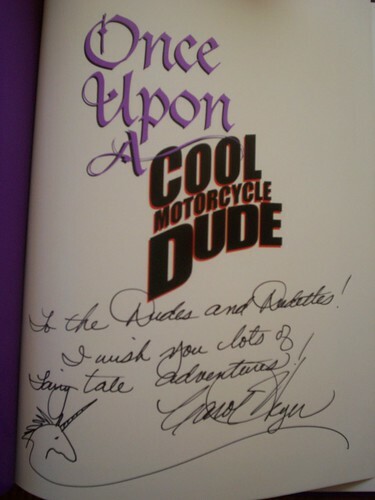 Becky was sweet enough to think of us when she was at a local library opening and picked this up for The Dudes. The author was there and she got it signed for us! 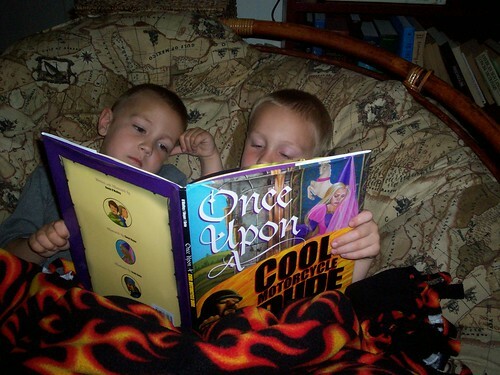 It is a big hit with the boys! I’ve already read it multiple times to them, and they keep wanting more! 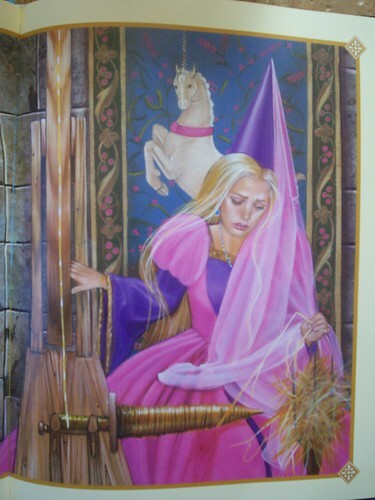 The illustrations (why do I wanna keep saying graphics!?) are amazing! Babydoll really liked it to, when she eventually got her turn. And there is even fiber content! There could not be more a perfect book for this family! 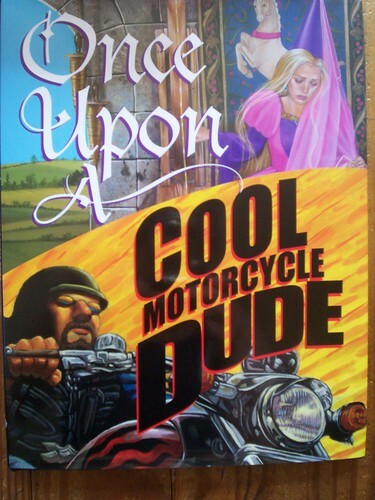 I highly recommend this book to Dudes and Dudettes of all ages! Thanks again Becky, you really made me feel loved! Aren’t knitters the best!! Still trudging through the boredom. It’s funny how I have been hankering to knit this sweater for months, but now I can’t wait for to be done. But enough of the irony, please! I just remembered that I promised details on where I bought the yarn. But I will go one step further and just fill you in on all the places that I frequently hunt. 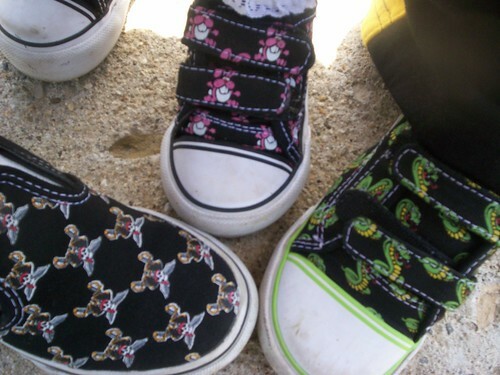 And between these 3, you could actually stop and be quite happy. But I never leave well enough alone. And I’m sure you probably know about most of these too, but I’ll do it anyway. Knitty Coffeeshop has a “Yarn Sale Spotters” category filled with tips too. I feel like I’ve forgotten a few, but it’s like I tell the Hubbo, there will always be a car sales man out there who wants to make a deal with you. Except this is yarn. Sidenote: And do also wanna bring up the LYS. Sometimes the few bucks you save aren’t worth it. For one it’s hard to do business online sometimes with the fact that colors vary from monitor to monitor and shipping times stop the instant gratification . But I think more importantly, is the personal connection you can get at a LYS. People are important! Sometimes I find it hard to keep it all in prospective. Finding the balance between passion and obsession. It is fun buying yarn, and I do equally enjoy finding deals. But it’s a fleeting fulfillment, you know? I’m glad I have my faith and my family to keep me grounded. What keeps you grounded?